When you’ve exhausted your blueberry repertoire, try these 11 ways to use this gently sweet fruit. Pancakes? Check. Muffins? Check. Pies, crisps and crumbles? Check. When you’ve exhausted your blueberry repertoire, try these 11 ways to use this gently sweet fruit. 1. Cocktails. Muddle the summer fruit in a gin-based pomegranate cocktail, a refreshing limeade or a simple bourbon old-fashioned. 3. Syrup. If booze-berries aren’t your thing, cook blueberries with water and sugar, then strain out the solids to make a syrup for adding to seltzer or pouring over pancakes. 4. Healthy PB&J. Skip the sticky sweet jam and stud your peanut butter sandwich with fresh blueberries. 5. Salads. Toss them in salads with crisp vegetables, like kohlrabi, red cabbage or fennel, and congratulate yourself for upping the antioxidants in your life. 6. Barbecue sauce. Preserve them in a sweet-and-savory sauce for brushing on ribs or pork chops. 7. Frozen Yogurt. 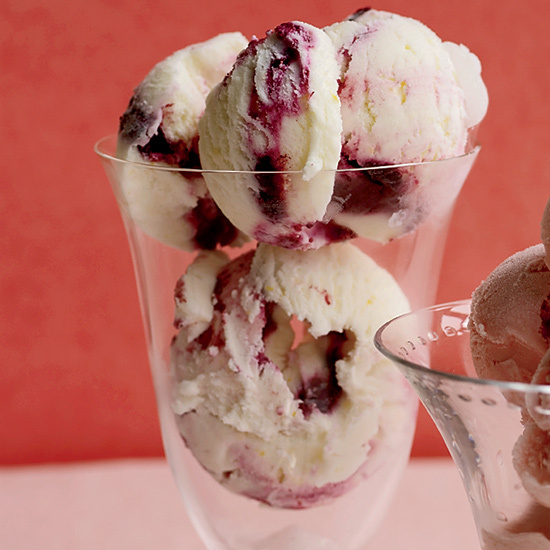 Make a blueberry sauce to swirl into lemon froyo (you may never eat ice cream again). 8. Shortcakes. End the strawberry monopoly over this dessert and layer blueberry compote (or lightly smashed fresh blueberries) in biscuits with whipped cream or crème fraîche. 9. Bread pudding. Chilly summer night? Fold blueberries into a custardy bread pudding and cozy up around the fire pit. 10. Popsicles. Freeze (tequila-spiked!) blueberry puree in popsicle molds. Tell any nearby children that they’re made with kale and they wouldn’t like them.